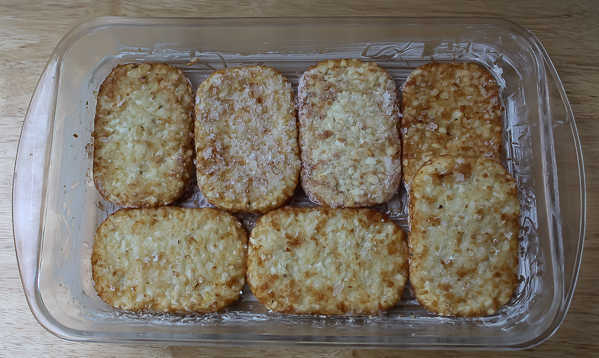 The hash brown patties from Trader Joe’s have become a staple around our house lately. 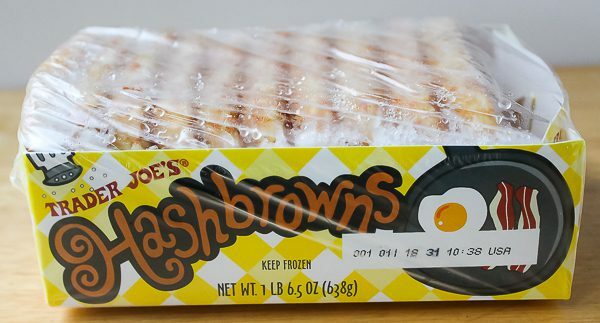 My husband Bill loves them served with eggs or as a replacement for other potato side dishes liked baked or mashed. I was getting tired of simply preparing them in a pan until crispy, so decided to try something new. Since Bill loves potato casseroles, that’s what I decided to try, but it had to be easy which to me meant start with the patties in the whole frozen state- no thawing and chopping or pre-cooking. I started by lining up the frozen patties in a buttered casserole pan. I found that my 8-by-12-inch Pyrex pan fit them almost perfectly with just a little overhang on one of the patties. Okay, now what? I knew I wanted to make this quick and easy with items I had in the refrigerator or pantry. Instead of preparing a cream or cheese sauce of some kind to pour over them, I wondered what would happen if I simply sprinkled the flour over the patties, dotted with butter and cheese, made another layer of the same, then just poured on some half-and-half and baked it. It would either work or become a curdled mess. Guess what – it worked! 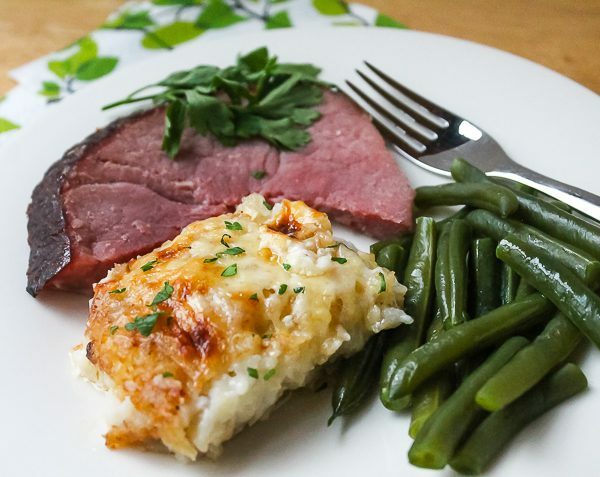 It came out creamy, crispy on top, and delicious, perfect to have with a ham steak and green beans, also easy to prepare while the potatoes are cooking. Bill had one of his favorite fall meals of ham, potatoes, and green beans. He’s pretty easy to please! What I also like about this super easy potato dish is that it is fun to play around with and can be made different every time. Next time I would try it with a different cheese, add fresh herbs, make it into Italian, Mexican, Mediterranean or other flavors. Ideas are endless. Heat oven to 325 degrees F. Generously grease an 8-by-12-inch baking dish; set aside. Lay seven of the frozen patties flat in bottom of pan; one of them will overlap slightly. Stir together the flour, salt, and pepper. Sprinkle 2 Tablespoons evenly over the potatoes in the dish. Scatter on half the onions over flour. Slice the cold butter into bits and scatter half of it evenly over the onion. Sprinkle with ½ cup cheese. Repeat layers in the same order starting with another layer of frozen patties and using the rest of ingredients except reserve the ¼ cup of cheese and chopped parsley for later. Slowly and evenly pour the half-and-half over potatoes. Cover pan with nonstick foil and bake for 15 minutes. Remove from oven and immediately raise oven temperature to 375 degrees. Remove foil and sprinkle evenly with remaining ¼ cup cheese. Return to oven, uncovered, and bake for an additional 15 minutes or until bubbly. Place dish under broiler to crisp and brown the top, watching carefully so it won't burn. Let dish sit for 10 minutes, uncovered, before serving. Serve hot, with chopped parsley sprinkled on top. Potatoes can be served cut into squares or scooped up. Note: This dish is easy to play around with and add other kinds of cheeses, herbs, vegetables, or make different flavors like Italian, Mexican, etc. Have fun experimenting! Fantastic! There are those days, we cooks all need those quick side dishes that save the day, or at least some time in the kitchen! Perfect for fall! Thanks for sharing!! Thanks, Kim. I know you will think of creative ways to use the basic recipe!